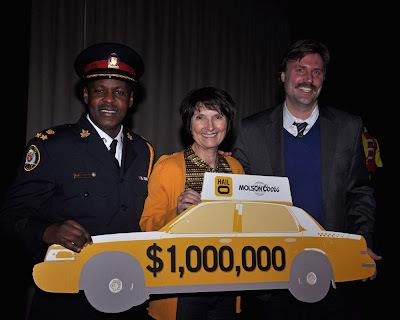 Hailo #Toronto has partnered with @MolsonCoorsCDA to give out @OneMillionHailo dollars in taxi fares to "help make the Toronto's 2012 holiday season the safest yet". With the money provided by Hailo and with Coors taking care of the distribution, bar patrons can take advantage of $10 dollar Hailo discount coupons towards a taxi ride home. Toronto Police Service Deputy Chief Mark Saunders, Molson Coors representative Carole Berry and Hailo Canada President Justin Raymond pose with a million dollar taxi cab prop during the announcement, in the photo at top. The Hailo holiday safety initiative found strong support from both the police and Molson Coors as they promote responsible choices. 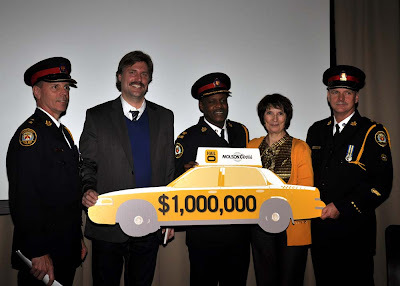 Deputy Chief Saunders noted that over 2,153 impaired driving charges have been laid to date in 2012 and by planning ahead and taking advantage of the Hailo and Molson Coors offer, injuries and deaths can be reduced. "At Hailo, we make it easy to get home from any holiday gathering - allowing anyone to hail and pay for a taxi with two taps on the screen of their smartphone," said Justin Raymond, President, Hailo Canada. "And now, we're making it easier on the wallet, too. We want to make it simple for people to choose the safe way home after a holiday celebration." "Safe travel becomes much more important during the holidays. At Molson Coors, we're committed to helping consumers make responsible choices about having a good time," explained Carole Berry, Lead, Corporate Responsibility Programming for Molson Coors Canada. "We're proud to play our part by encouraging every Torontonian to plan a safe ride home with Hailo." The offer ends January 9, 2013 and you can find a list of participating establishments on their facebook page here. Hailo has quickly become indispensable for many since launching on September 26, 2012 and the growing company has over 600 participating drivers. With two simple taps on a smart phone you can arrange for a cab and follow its route on your phone as it approaches your location.